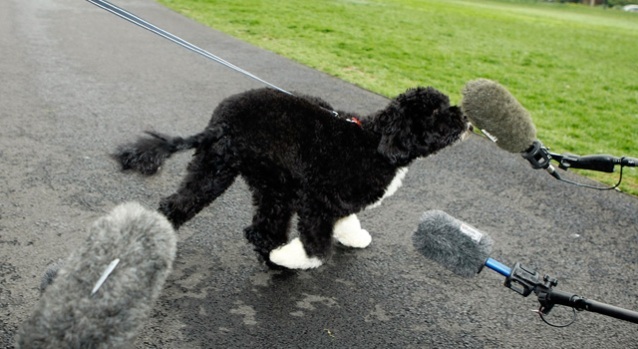 Don't Get a Dog, Barack! This animal is superior to a Portuguese water dog in about a thousand ways. Oh how darling,Barack Obama is going to adopt a dog and has narrowed down his choices to a Portuguese water dog and a Labradoodle. Question: Why does Barack Obama hate his children so much? The Portuguese water dog is a walking toilet brush with the same duplicitous and sinister temperament as its progenitor, Christopher Columbus. Meanwhile, the Labradoodle combines all the compulsive slobbering idiocy of the Labrador retriever with the mincing preciousness of the poodle. Both of these breeds are garbage and should only be used to supervise prisoners or fetch dead bodies out of swamps. The far better choice is obviously to adopt a pleasant and neat little kitty kat, perhaps an adorable Sphinx if they're worried about allergies. Or if the Obamas are really serious about getting a hypoallergenic cat, they'll spend the $37,000 to get this insane leopard-looking thing that will grow to about 25 pounds. What little girl doesn't want a pet leopard? But, being the obviously terrible parents they are, Michelle and Barack will doubtless welcome some wretched canine filth-monster into their home because it "doesn't shed," and then they will be shocked when it eats all the legs off their furniture and poops sawdust for days. Sara K. Smith writes for Wonkette. She prefers mutts.